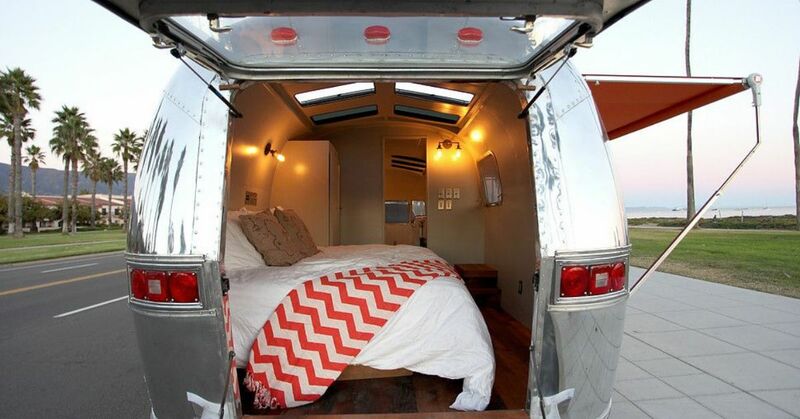 When a globe-trotting businessman needed a quiet respite for his time stateside, a home on wheels (ironically) was just what he needed to feel grounded. 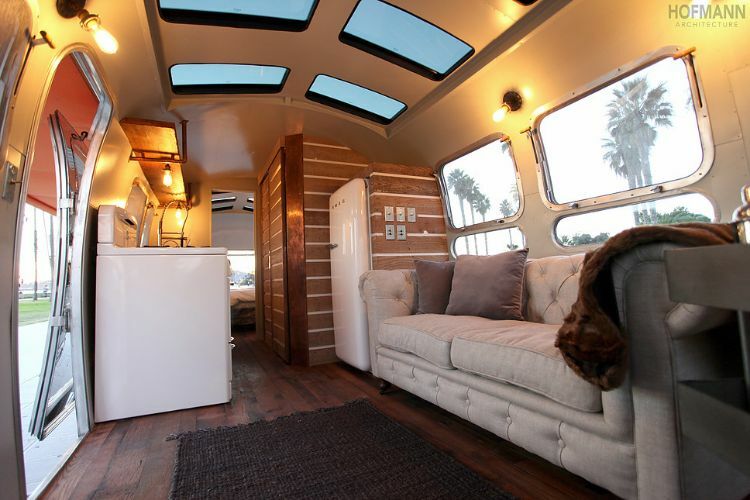 Along with the help of Innovative Spaces – which specializes in renovating trailers and mobile homes – he set out to create a sophisticated, international oasis in his 31-foot 1971 Sovereign. 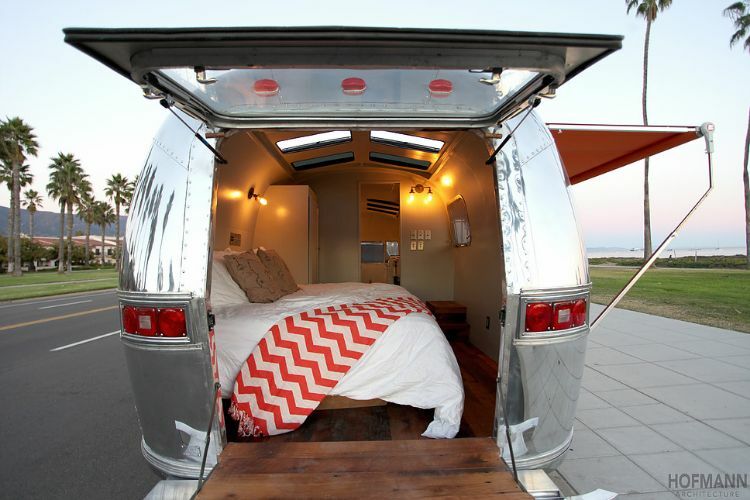 The Airstream is parked on a roomy pad in Northern California, in a prime slice of Wine Country. Because the homeowner is frequently jetting between Europe and Asia, his West Coast home didn't need to be large, but it had to offer a tranquil landing pad for his time at home. To maximize the area's natural views, 12 rooftop windows open and close in pairs with the flip of a switch. Inside, the design was intended to incorporate international influences that speak to the homeowner's traveled lifestyle. In the kitchen, copper countertops with a patina finish create a Euro aesthetic and offer ample prep space, complemented by a 20th-century Smeg refrigerator next to a paneled wall for a retro vibe. A 1930s Wedgewood gas stove and farmhouse apron sink with pull-down chrome faucet offer all the modern amenities in a look inspired by the Italian countryside. The Petite Kensington upholstered sofa is among the vintage heirloom pieces throughout that elevate the space. Interior walls are clad in reclaimed barn wood flanked by white plexiglass, which combine to create the illusion of a larger area. Throughout, aged steel sconces from Restoration Hardware are finished in an oil-rubbed bronze with bare Edison bulbs for an antique aesthetic. To the back of the Sovereign, the bedroom accommodates a full bed, tucked under two rows of skylights to wake up to the sun. All that light allows the home to be completely solar-powered. 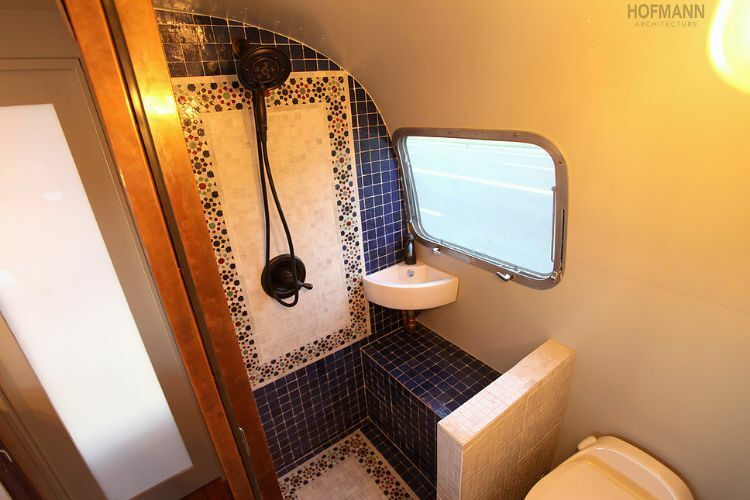 Custom Moroccan mosaic tile stretching up to the curved ceiling creates global luxury in the bathroom. Venetian bronze sink and shower fixtures complete the ornate look, accompanied by copper accessories and a sliding barn door for style and privacy.